We were greeted to fresh snow and sunny skies this morning in Whistler, such a beautiful sight to start the day with. With a busy and successful US thanksgiving long weekend now behind us and both mountains officially open, I hope you will get a chance to visit and play in the snow. There has been a bit of a rush for people looking to complete their purchase of Whistler real estate in time to be here for Christmas or capitalize on Christmas and New Year’s rental income. The last week of November saw 18 sales, which was the largest number of sales in a week that we have seen for several months. This compares to the previous week’s total of 11 sales. 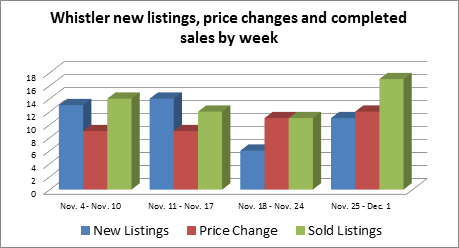 We saw 11 new listings come to market and 12 price changes this week. Whistler currently has 452 active listings*. To view all the past weeks new listings, price changes and sales please click here. We are contiuning to see a strong level of Buye activity here in the valley. Sales this past week consisted of 3 chalets between $1,300,000 and $5,000,000; 6 Condos between $138,000 and $842,000; 1 duplex which sold for $780k and 7 townhomes selling between $209,000 and $1.4M. For information on these and other Whistler real estate options, please contact me. I would be happy to discuss your goals for a Whistler purchase or sale and how we can achieve them. Have a great week ahead! *Based on Whistler Listing System statistics for Chalet, Condo, Duplex, Townhome and vacant land listings.